The class contains API level of the General Fuse algorithm. Disabling history collection - allows disabling the collection of the history of shapes modifications during the operation. 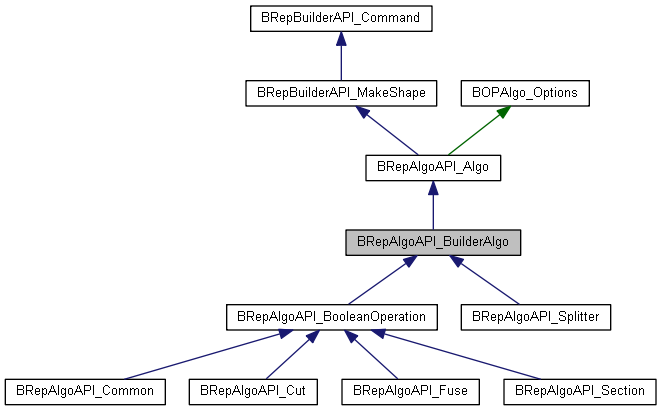 BOPAlgo_AlertBuilderFailed - in case building of the result shape has failed. Warnings statuses from underlying DS Filler and Builder algorithms are collected in the report. The class provides possibility to simplify the resulting shape by unification of the tangential edges and faces. It is performed by the method SimplifyResult. See description of this method for more details. Constructor with prepared Filler object. Reimplemented in BRepAlgoAPI_Section, BRepAlgoAPI_BooleanOperation, and BRepAlgoAPI_Splitter. Clears the algorithm from previous runs. Faces can generate new edges and vertices. Returns true if any of the input shapes has been deleted during operation. Normally, General Fuse operation should not have Deleted elements, but all derived operation can have. Intersects the given shapes with the intersection tool. Checks if the shape <theS> has been completely removed from the result, i.e. the result does not contain the shape itself and any of its splits. Returns TRUE if the shape has been deleted. Returns the shapes modified from the shape <theS>. If any, the list will contain only those splits of the given shape, contained in the result. Returns a list of section edges. The edges represent the result of intersection between arguments of operation. Sets the glue option for the algorithm, which allows increasing performance of the intersection of the input shapes. Simplification of the result shape is performed by the means of ShapeUpgrade_UnifySameDomain algorithm. The result of the operation will be overwritten with the simplified result. The simplification is performed without creation of the Internal shapes, i.e. shapes connections will never be broken. Simplification is performed on the whole result shape. Thus, if the input shapes contained connected tangent edges or faces unmodified during the operation they will also be unified. After simplification, the History of result simplification is merged into the main history of operation. So, it is taken into account when asking for Modified, Generated and Deleted shapes. Fuzzy tolerance of the operation is given to the Unifier as the linear tolerance. Non destructive mode here controls the safe input mode in Unifier. theUnifyEdges Controls the edges unification. TRUE by default. theUnifyFaces Controls the faces unification. TRUE by default. theAngularTol Angular criteria for tangency of edges and faces. Precision::Angular() by default. Building tool performs construction of the result basing on the results of intersection. Check for inverted solids management. Intersection tool performs intersection of the argument shapes. Flag to control whether the intersection of arguments should be performed or not. History of result shape simplification.